The Low Volume Vehicle Technical Association (LVVTA), the organisation responsible for modified vehicle regulations on behalf of the New Zealand government, is set to celebrate a major milestone later this year when it celebrates its 25th Anniversary. However, a few days ago, in late June, the association reached another great milestone, the production of its 150,000th certification plate. The milestone plate was issued for a 2003 Ford Falcon owned by Auckland’s Scott Burmeister (seen here on the right). As the owner of Gray & Galpin Panelbeaters, Scott performed the work on the vehicle himself. The build began with a damaged 2003 Ford Falcon station wagon, from which the rear end was removed and replaced with that from a same-generation Ford Falcon ute. Rather than create a two-seat ute, Scott extended the wheelbase to add a second set of doors and second row of seats, creating a double cab ute that Ford themselves never offered. The modifications were done in such a way that the vehicle looks factory in all aspects, including the addition of built-in chassis connectors to reinforce the vehicle’s structure. Due to the monocoque design, plenty of reinforcement was required to ensure the vehicle’s strength remained intact, however, Clint Field, the Low Volume Vehicle Certifier who inspected the vehicle, couldn’t have been happier with the structural integrity and standard of workmanship on the vehicle. As well as the body and chassis modifications, the Falcon was also certified for 20x8.5-inch and 20x9.5-inch wheels, a custom drop fuel tank and rear bucket seats. Scott’s vehicle is powered by a factory-optioned 5.4-litre quad cam ‘Boss’ V8 engine backed by a five-speed manual transmission. Clint Field has been an LVV Certifier since July 2006 and is now also a valued member of the LVVTA’s Technical Advisory Committee. New Zealand Hot Rod Association, MotorSport New Zealand, Sports Car Club of New Zealand, Constructors’ Car Club, Vehicle Association of New Zealand for People with Disabilities, New Zealand Motor Caravan Association, New Zealand Four Wheel Drive Association, Vintage Car Club of New Zealand, and Kiwi Trikers Social Club. 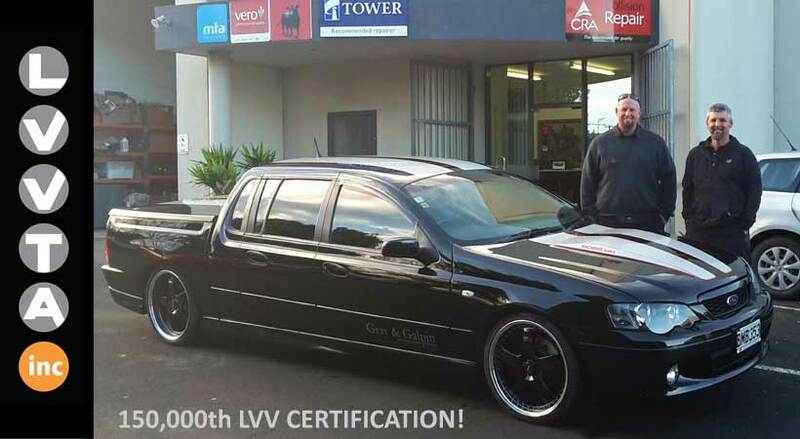 Above: Auckland Certifier Clint Field (left) stands next to Scott Burmeister and his 2003 Falcon, which has been skillfuly converted into a double-cab utility vehicle.